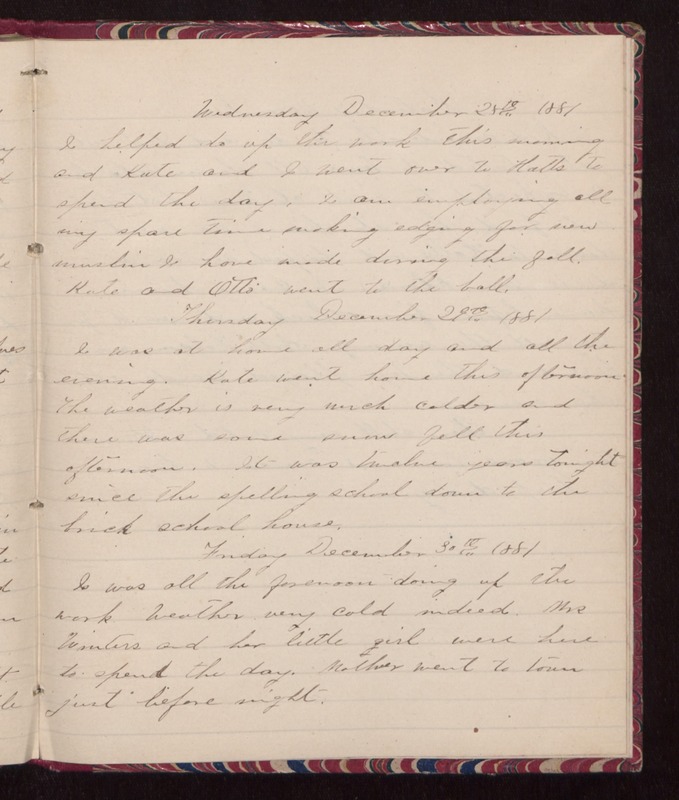 Wednesday December 28th 1881 I helped do up the work this morning and Kate and I went over to Hatts to spend the day. I am employing all my spare time making edging for new muslin I have made during the fall. Kate and Otto went to the ball. Thursday December 29th 1881 I was at home all day and all the evening. Kate went home this afternoon. The weather is very much colder and there was some snow fell this afternoon. It was twelve years tonight since the spelling school down to the brick school house. Friday December 30th 1881 I was all the forenoon doing up the work. Weather very cold indeed. Mrs Winters and her little girl were here to spend the day. Mother went to town just before night.